Be sure you've installed BlogFeeder ® via the Shopify App store and that you've selected your plan so installation is complete. You'll be up and running in no time! 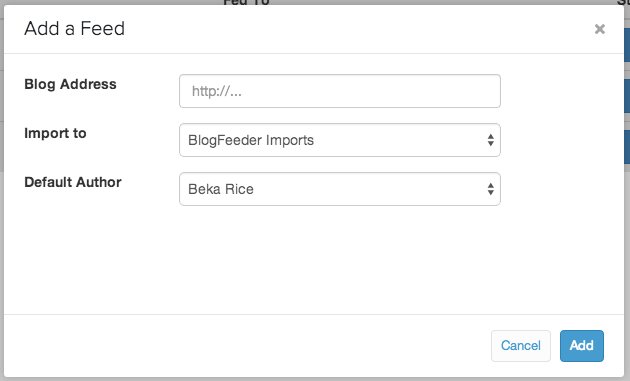 You'll be able to import blog feeds to a new Shopify blog, or you can import posts into an existing blog. Usually the store already has a default blog unless you've deleted it, which is simply called "News". You can use this blog or rename it if you'd like under "Blog Posts > Manage Blogs". 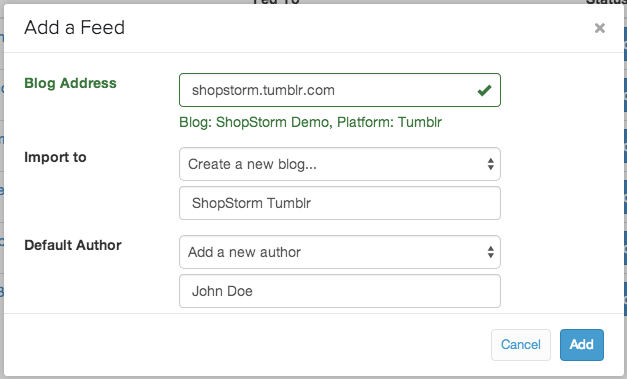 Determine how you'd like to set up your store blog(s), and we can begin to add some feeds! Go to the app page by visiting "Apps" in your Shopify admin. Click on BlogFeeder to get started. When you start to use the app, you'll need to click "Add Feed" to be able to add a feed to your store. This will bring up the window for you to enter the feed information. Enter the URL of the site for your blog. You can use the homepage URL, or the specific URL for the blog. If the homepage URL doesn't detect your blog automatically, check out our article on finding the RSS feed for your blog for some extra guidance (this will help to use Pinterest, etc). Once BlogFeeder has checked and found your blog, you can select which Shopify blog it should feed posts into, or you can create a new blog on the spot! You may also be prompted to choose a default author (this depends on the type of import you're doing, and may not always be shown). You can choose an author, or create a new author. This author will be used if BlogFeeder can't find out who created the posts. That's it - click "Add"! After a minute or two, your blog will be imported. You can go back to the Store Admin to see all the newly imported posts. Please note: BlogFeeder will import about 5 posts for each blog so that you can take a look and make sure that everything is displayed as expected. The rest of the import will complete later, as BlogFeeder queues up the rest of the job depending on how many resources are available. A full import will usually take about an hour for the first import. If you want to keep tabs on BlogFeeder, you can see the status of all of your feeds from the main page. BlogFeeder will check your blogs for updates or new posts every hour or so, or you can force BlogFeeder to find and synchronize posts on demand by clicking the "Synchronize" button. That's all that you need to get started! Note that you should not delete old blogs if possible if they contain images, as BlogFeeder uses these images for reference in your imported posts. Shopify does not provide any way for us to import images, so we have to link to them on your old blog. You may also want to read up on editing feeds and other advanced uses for more details on what BlogFeeder can do.